“Without Jenny” by Mark Gunther is a powerful story about love and loss, and one family’s journey through grief. The Rosenberg’s had the perfect life. A loving and passionate marriage, two great kids, and fulfilling, satisfying careers. It only took a split second to change their lives forever when ten-year-old Jenny is killed in what can only be considered a freak accident. Joy Rosenberg is consumed with guilt as she relives the terror over and over again. She tries everything to get through the grief relying on her faith, her family, her job and exercise – but nothing even comes close to numbing or releasing the pain. As Joy struggles to find some semblance of a new normal, her family is falling apart. Powerless and without hope or purpose, how does she go on living without Jenny? Oh wow. How to start? There is no greater loss a parent can face than the death of a child. 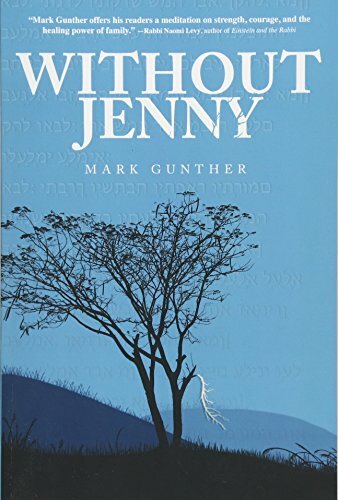 Before reading “Without Jenny” I would have said that I could not even comprehend the spectrum of emotions one endures, but Mark Gunther writes with such feeling and clarity I could actually imagine “what-if-it-happened-to-me” scenarios. The result, a haunting chill that won’t soon be forgotten by this reader as I felt like I was getting a glimpse into his soul. Indeed, the pages are steeped with a disturbing reality that can only come from first-hand knowledge. Readers experience different levels of grief through the characters as related by each, with the focus on Jenny’s mother, Joy Rosenberg. Her anguish is mortifying and sobering, yet we also get clear insight into the strength and depth of her character as she tries to manage and cope. Her personality shines through, whether she is steering well-intentioned but ill-prepared well-wishers into silence, or trying to be present for her husband and son. I was moved by every element of this story. The characters, the storyline, the settings, the impact of such a tragic accident – everything written in a way that both compels and repulses the reader at the same time. You want to stop reading, the tragedy is so unbearable – but you can’t. Like watching a horror movie snuggled underneath a blanket, peeking out at the screen with one eye and a hand over your mouth to quiet a scream. It’s hard to adequately articulate the eloquence of the writing and the influence it has on the reader. That Gunther is able to so meticulously relay the feelings of a grieving woman speaks volumes to his power with the written word. I highly recommend “Without Jenny” and commend Mark Gunther on the authenticity and brilliance of his debut novel. This is a must-read story that will leave an imprint on your heart forever.